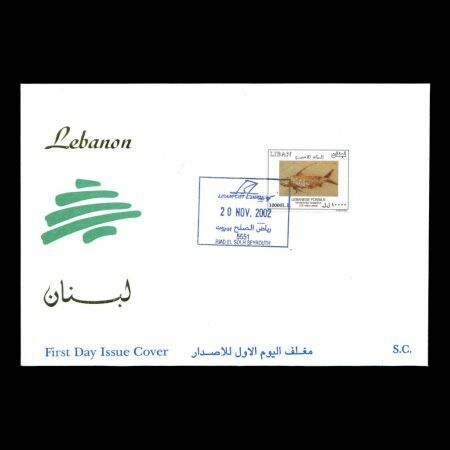 Lebanon 2002 "Sightseeings: Lebanese Fossil"
Between 11.10.2002 and 08.01.2003 post authorithy of Lebanon issued 10 definitive stamps shows various Sightseeings of the country. 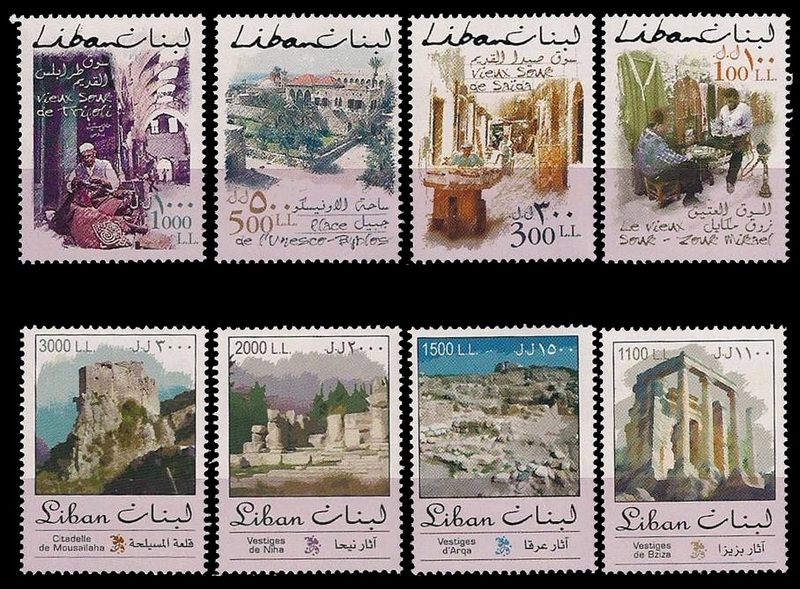 The first 8 stamps are issued on 11.11.2002 and 20.11.2002 are "traditional" sightseeings stamps shows some famous buildings and landscapes. 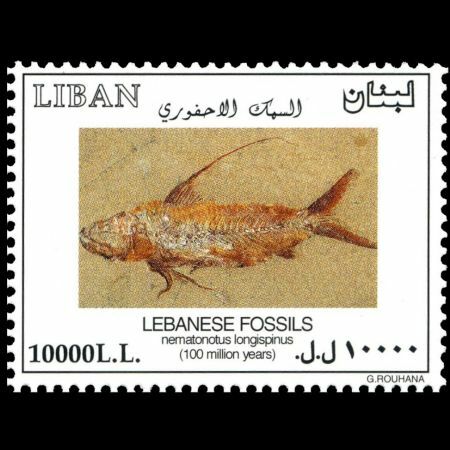 The last two stamps of the serie are Fish fossil (Nematonotus longispinus), issued on 22.11.2002 and Amber with insect (Libanobythus milk) inside, issued on 08.01.2003. 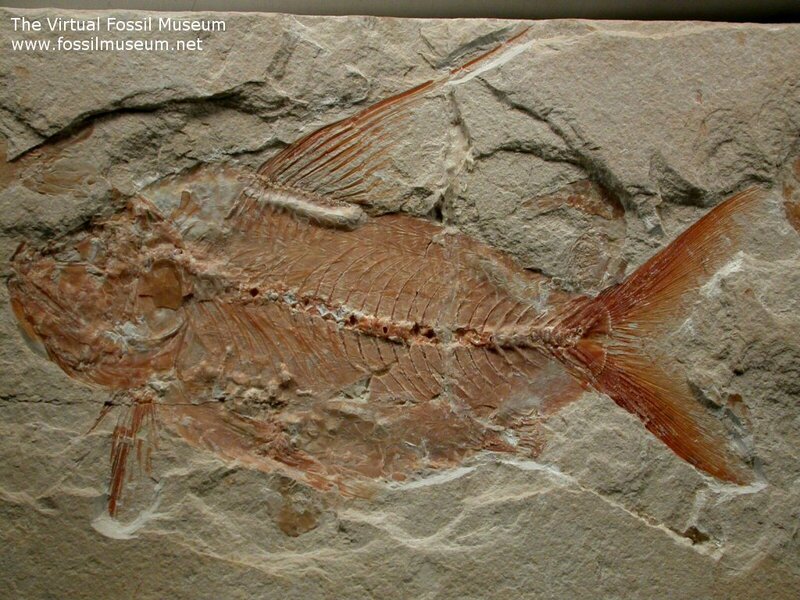 Image from "The Virtual Fossil Museum"
The Cretaceous sublithographic limestone deposits of Lebanon is a rich Lagerstatten with an amazing diversity of fauna. The sublithographic limestone deposits of Lebanon are dated to the Cenomanian Stage of the Middle Cretaceous, some 93 to 97 million years ago, and are most famous for exquisitely fossil fish preservation, but also produces a diversity of other well preserved invertebrate fossils such as shrimp and lobsters. 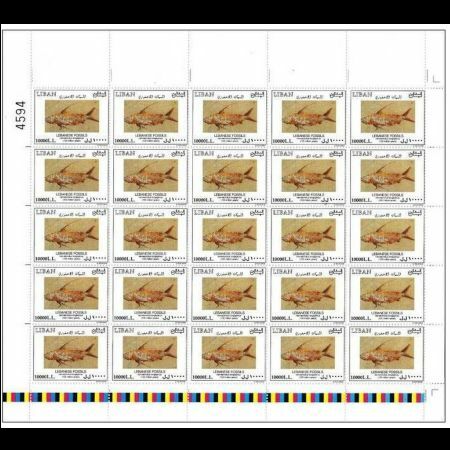 The stamp showsNematonotus longispinus fish found there. Nematonotus develop a dramatic flag-like dorsal fin extension, hence the generic name longispinus. The dorsal here certainly lives up to that name, demonstrating this is an adult example. The genus became extinct during the Cretaceous. The detail in the caudal fin is remarkable; notice too the fine detail to the vertebral column. There are several partial shrimp of the genus Carpopenaeus present as well, with another on the reverse. Note:This page is incomplete, some info is missing. In case you have the any additional information please email to me.